Julie Nelson from Freeport sent in these pictures looking to the north and west of the incoming rain/isolated thunder. Expecting mostly heavier rainfall, but a clap of thunder or two is possible. The afternoon has been quiet and cool (compared to what temperatures typically are at the end of June). But that may be soon changing. 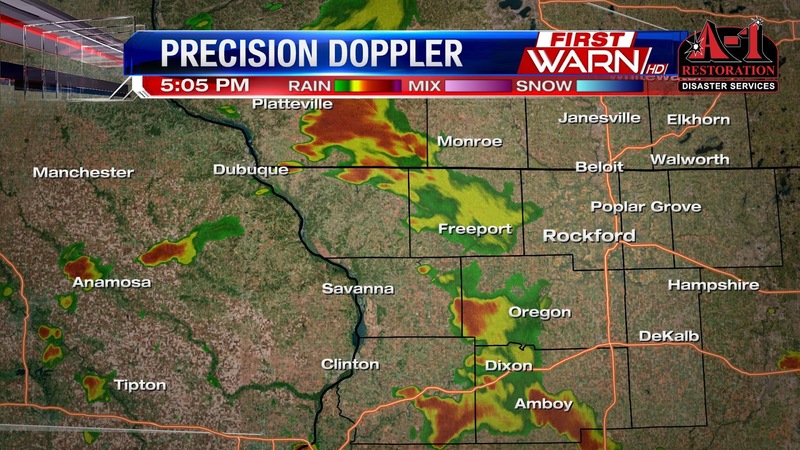 A line of thunderstorms, non-severe at the moment, are sliding into southwest Wisconsin. This line is forming ahead of a cold front and upper level low. Further back to the northwest, there were a couple severe thunderstorm warnings near the Wisconsin Dells. But as the line shifts southeast, it's encountering a little more of a stable air mass. The Storm Prediction Center does have parts of southern Wisconsin and northwest Illinois under a slight risk for strong/severe storms as there isn't much of a 'lid' on our atmosphere. But I feel our threat for gusty thunderstorms will continue to decrease through the evening. 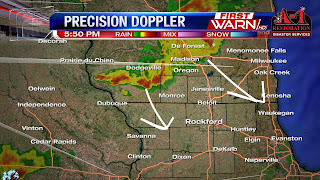 Look for this line to move into southwest Wisconsin between now and 7pm, and northern Illinois between 7pm and 10pm. The First Warn Weatherisk will remain Moderate until Midnight and then drop back down to Low for the overnight. As mentioned in previous posts northern Illinois is really needing the rain, at least most of it does. While some areas of the Stateline have received quite a bit of rain (southern portions of Lee and DeKalb counties) others like Rockford have really missed out on the heavy soaking rain we need. 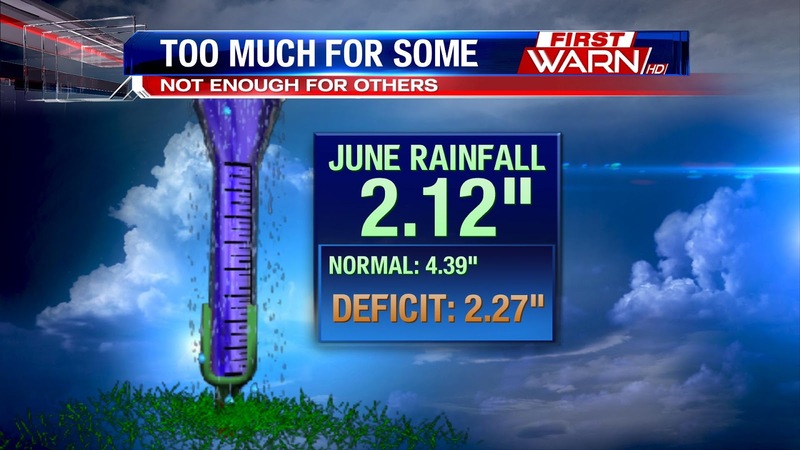 Currently for Rockford, the deficit is up to 2.40" from the 4.52" we need for the month. The current total at 2.12." The newest drought monitor posted today, surprisingly not showing the abnormally dry conditions expanding northward, but southward. 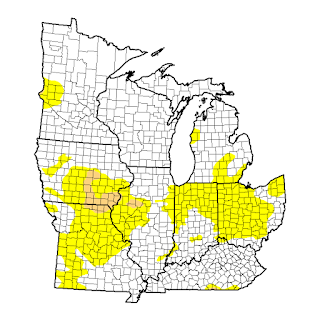 There has also been moderate drought conditions expanding in western Illinois and continuing into Iowa. Currently 67.69% of the state is not experiencing any type of drought condition, which is down from the 72.3% last week. The moderate drought category has moved from 2.38% of the state to 2.78%, and the abnormally dry category sits at 27.7%. With minimal rain expected for northern Illinois and southern Wisconsin through next week, we'll watch again for the possibility of the dry conditions to spread northward. Holiday Weekend Doesn't Look too Shabby! Wow! Can you believe that in less than a week it will be the 4th of July?? Where has this summer gone? Before we know it kids will be going back to school, leaves will be falling from the trees and we'll be talking about that four letter no-no 's' word...snow. But let's not get ahead of ourselves here. Let's focus on the weekend because right now, it looks pretty nice. 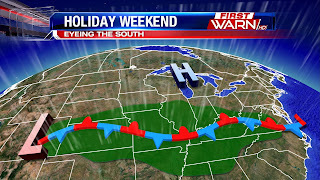 Another area of high pressure will move into the Great Lakes following Thursday's cold front. 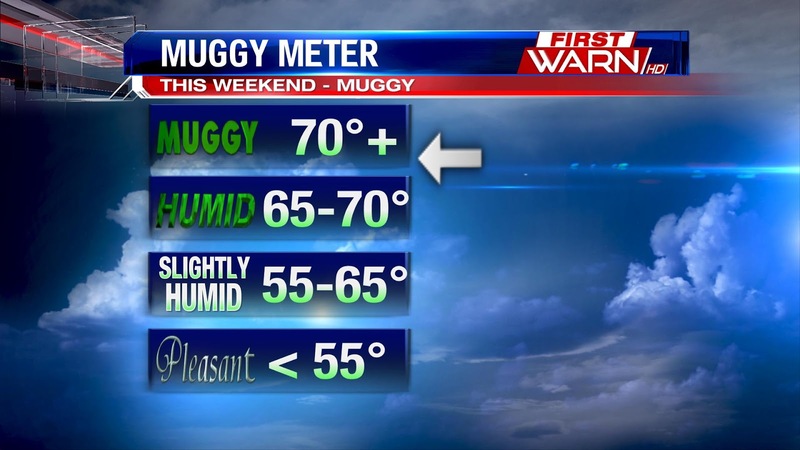 This will help keep the humidity in check for the weekend with a gradual warming trend through Saturday. Jet stream winds this week are going to be fairly weak and often times this can cause slow moving storm systems. This looks to be the case to the south of Illinois late Saturday and Sunday. High pressure should be strong enough to hold a stationary front over central and southern Illinois Sunday and Monday (4th) keeping most of the rainfall to the south. However, I've noticed just a slight shift northward over the past day with our forecast models that does bare some watching. If that high isn't as strong as we think it is there could be a few showers around for some of us Sunday and Sunday night. Right now the 4th looks dry. We'll keep you updated throughout the week, but at this point it isn't something I would get too carried away with. It's nice to have a few dry days here and there but the northern part of the state has missed out on some of the bigger rainfall. 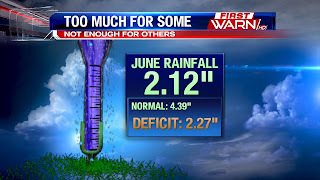 As of today, June 28th, our monthly rainfall total is a little over two inches. We should be over four inches for recorded rain! This puts us over two inches below where we need to be. There was a decent rain a couple weeks ago with strong thunderstorms that roared through during the overnight, but since then we've been pretty quiet. It hasn't been that way, though, for the entire viewing area. Our far southern counties of Lee and DeKalb have picked up quite a few inches of rainfall for the month. Almost giving them too much. There will be a little rain for Thursday, but it does not look like enough to make up for our deficit. 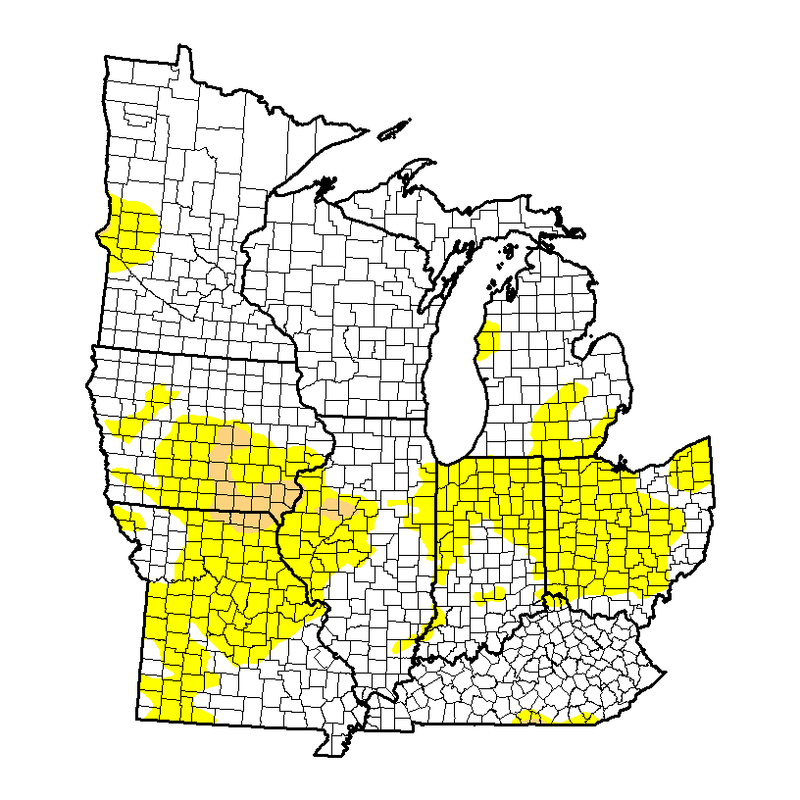 The latest drought monitor from the National Drought Mitigation Center does show drier than normal conditions developing over parts of Illinois and southern Iowa, with moderate drought conditions developing in southeast Iowa. It's amazing to see how spatially driven the rainfall has been this month, not only from northern Illinois to central Illinois, but also from county to county. Hopefully we can make up for some of that rain in the coming weeks, but this upcoming week doesn't look too promising. The next drought monitor will be released this Thursday. It will be interesting to see if the 'abnormally dry' conditions get extended any further north. After a steamy weekend and start to the work week with highs in the low 90's and upper 80's, Stateliners will notice a BIG difference this afternoon. A cooler air mass arrives from the north bringing with it comfortable temperatures in the mid 70's this afternoon. Also, a high pressure system currently in southern Minnesota will allow for lots of sunshine throughout northern Illinois and southern Wisconsin today, and lowered humidity as well. This is due to winds moving clockwise around an area of high pressure, and with high pressure to the northwest of the area, this brings us north and northeasterly winds. We get back into the low 80's both Wednesday and Thursday, but with that comes a chance for rain Thursday afternoon and evening. Showers and storms will develop ahead of the cold front Wednesday and Thursday. Rain and storm activity will remain west of the Mississippi Wednesday through the central plains. 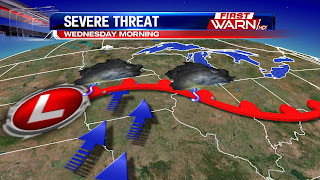 Thursday the cold front sinks into central Wisconsin allowing for a chance for showers and even a few storms in the afternoon and evening hours, but no severe weather is expected. This front brings highs back into the mid 70's by Friday afternoon. You hear the meteorologist talk about it all the time - a 'cooler' air mass or a 'warmer' air mass will heat up or cool down our temperatures. But have you ever really wondered just where those air masses originate from? 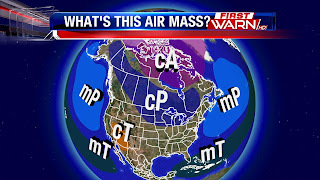 Have you ever heard the two terms Continental Air Mass or Maritime Air Mass? Maybe you have, but just haven't given it much thought. Well an air mass, like a body of water, is a large body of air with fairly uniform temperatures and humidity. 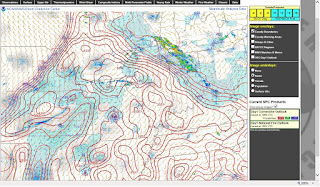 Depending upon where that air mass originates from, will help determine its characteristics. And just as if you were to heat up or cool down water for a long period of time, the longer an air mass stays over a particular region, the more the air mass will acquire that lands characteristics. There are basically two main air mass types that are determined by their moisture content. They are Continental and Maritime. A Continental air mass - written out on maps as a lowercase 'c'- starts over land and is a dry air mass because of it. A Maritime air mass - written out on maps as a lowercase 'm' - starts over water and is a moist air mass. From there, you can break down the air mass category even further to account for the different surface temperature of where the air mass is originating from. For example, an air mass that develops over land near the Arctic will be known as a Continental Arctic Air Mass because of the very dry and cold region it originates from. Polar air masses form over the higher latitudes of both the land and sea, but are not quite as cold as the 'cA' air mass (Continental Arctic). Tropical air masses can originate from either land or water in the desert southwest or near the Equator. Here's the fun part - we can now begin putting together or different types of air mass designations together. For example, an air mass that originates at the higher latitudes over water is referred to as a 'mP' air mass, or Maritime Polar air mass. Or an air mass that originates over land from the southwest will be a 'cT', Continental Tropical air mass because it's a hot and dry, but is close to the tropics. Following Monday evenings cool front a different type of air mass will arrive for Tuesday. 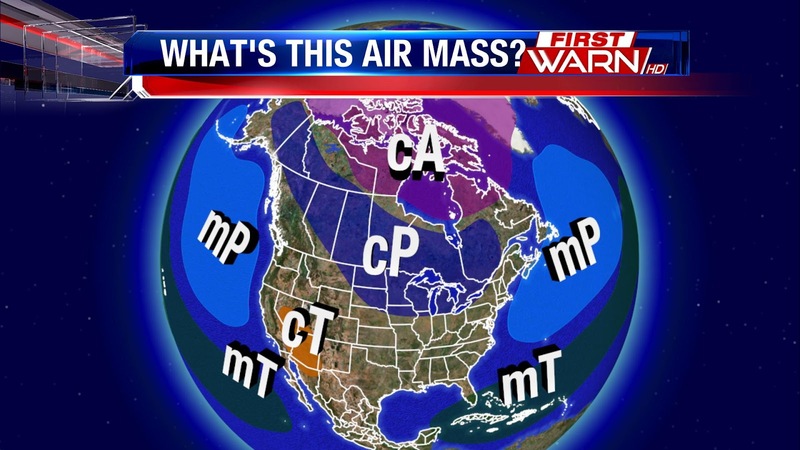 Any guesses as to what type of air mass that will be? If you guessed 'cP', you're right! 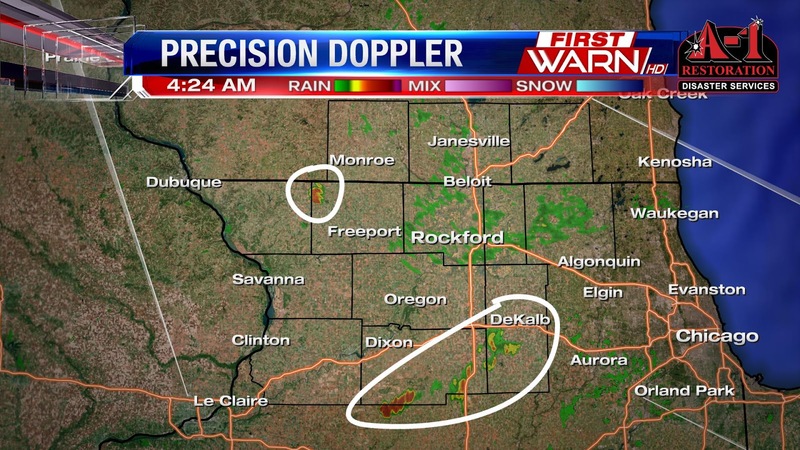 It is a quiet Monday morning, so what is up with Precision Doppler showing a few returns in northwest Stephenson County and southern Lee and DeKalb Counties? If you didn't know any better, you may just think that those are small thunderstorms based on simply looking at the radar. However, that is not rain falling near Lena or Paw Paw. Rather, those radar echoes are wind turbine farms! Yes, that is correct. Sometimes when things are quiet and there is no rain or clouds around to obstruct the radar's beams, weather radar can pick up on things like birds, bats, insects, or wind turbines. The reason behind this is because when the radar beam extends out, it can come into contact with a wind turbine if it is in the radar's path. Then, as it rebounds back towards the radar, it shows up as what you would typically deem rain or snow on Precision Doppler. 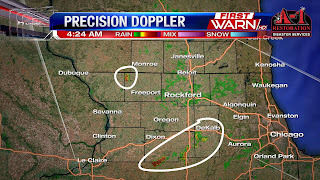 This phenomenon can occur with other non-precipitation items as well if they are in the path of the radar's beam. With windmills, the spinning nature of the blades can even trick the radar into thinking there is rotation in very rare cases. This has happened a few times, including in Kansas several years ago. 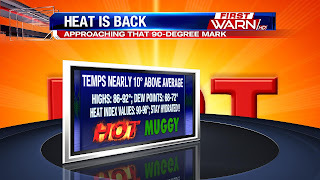 The high temperature Sunday reached 91 degrees making it the 7th time during the month of June the high has either reached, or gone above, 90 degrees. Normal highs for this time of the month are in the low to mid 80's, and we've been well above that for some time. The average monthly temperature so far for June is 71.8 degrees, pushing it 2.7 degrees above average. Over the past 6 years, this makes June 2016 the warmest June since 2012. Locally and across the U.S. June 2012 was a very warm year. Highs Monday will warm back into the middle and upper 80's, but then fall a little below average for the remainder of the week. Giving us a nice break from some of the humidity. The hottest day of 2016 thus far is in the books! 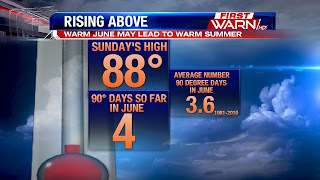 Our high temperature in Rockford hit 93° on Saturday, which is good for tying the hottest temperature recorded this year not even a week ago. Heat index values -- which take into account both the temperatures and humidity -- soared into the upper 90s and lower 100s. Those values are some of the highest we have seen this year. 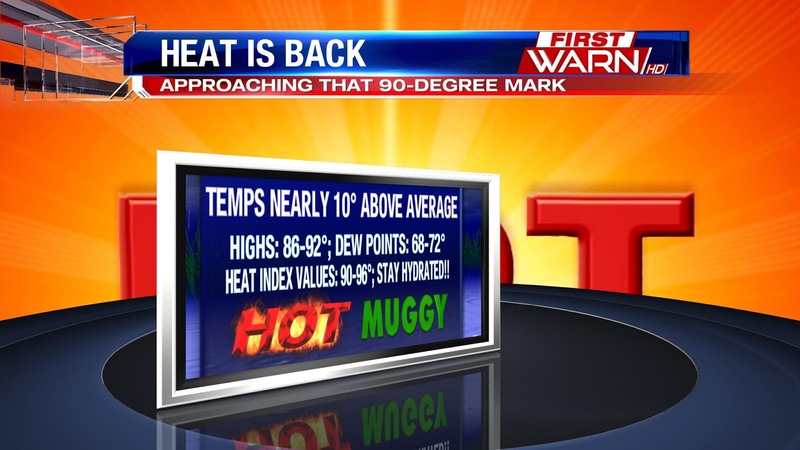 Regarding other hot days this year, we have reached the 91° mark twice. That occurred on both June 10th and 11th. None of these temperatures were record highs, but they have been making this summer feel a little hotter than previous summers. The good news is that other than possibly reaching the 90-degree mark on Sunday, there are no days in the extended forecast that feature high temperatures in the 90s. In fact, we are going to be entering a stretch of days that will be considered unseasonably cool for this time of year. High temperatures into next week will likely be stuck in the 70s for three straight days. We may even see lower 70s for highs on Tuesday! So if you are a fan of the heat and humidity, next week may not be the best. However, if you (like me) are in need of a little break from the heat and humidity, then next week is shining with gold! It won't be the best weather to go swimming in, but it will be perfect weather to go to the park, golf, get some yard work done, or even just drive that convertible or motorcycle around town! Well, if you aren't a fan of summertime heat and humidity, this weekend may not be the ideal forecast for you. We had temperatures reach the lower and middle 80s Friday afternoon with dew points in the middle 60s. That made it feel quite humid. However, both our temperatures and dew point temperatures are going to rise this weekend. 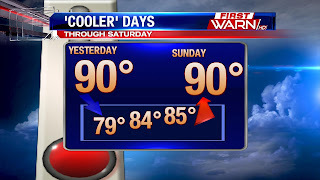 Expect temperatures in the upper 80s and potentially lower 90s for both Saturday and Sunday. 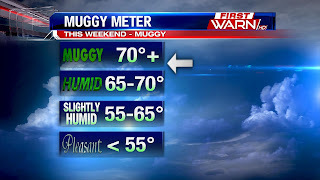 Expect dew points to rise into the "muggy" or "oppressive" category as they reach the upper 60s and lower 70s, especially Saturday ahead of an approaching "cold front." That is in quotations because once it moves through, temperatures won't fall on Sunday or Monday. In fact, while this won't be the hottest air we've seen this year, it will be close to the top. Our average high temperature is around 84°, so we will definitely be a good 5-8° above average through the weekend. So, what do these high temperatures and high dew points equate to? High heat indices. Our heat index, or "feels like," temperature will be between 90° and 96° during the peak heating times on both Saturday and Sunday. For that reason, be sure to utilize all heat safety precautions, such as wearing light colored clothing, staying hydrated, and taking breaks from the sunshine. 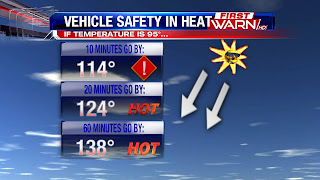 And, as has been discussed several times this year already, it is very important to avoid leaving people and pets inside of a vehicle in this kind of heat. The inside of a car can become extremely hot very quickly if the windows are rolled up. In fact, if the outside temperature is 95° (which we will be close to this weekend), the temperatures inside of a car are well above that. After 10 minutes go by, the inside of a car will be near 114°. 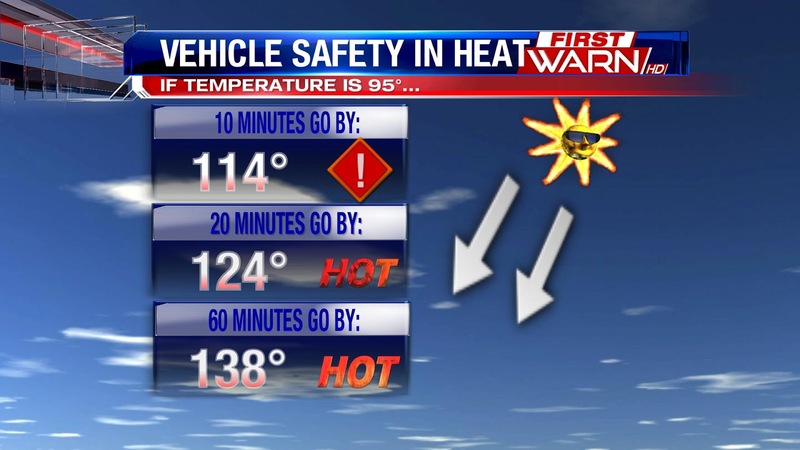 After 1 hour goes by, the inside of a car will be nearly 138°! That kind of heat can be -- and it has proven to be -- deadly. Just remember to check your vehicle in this heat before leaving it unattended! We kick off the weekend with a picture perfect afternoon, temperatures will warm into the low to possibly mid 80's with lots of sun and low humidity. Saturday and Sunday will turn hot and humid however, with the passage of a warm front on Saturday afternoon. Temperatures warm into the upper 80's with heat index values in the low 90's. But if you're heading out to the DeKalb Greek Fest it will be a fairly dry day, just feeling a bit more steamy. Our next low pressure system will bring an isolated rain chance late Saturday but more likely chance for showers and a few storms will be Saturday evening into early Sunday. It won't be a wash out Sunday though, the rain will end early in the day. The pattern changes heading into next week, bringing drier and cooler air into the region, possibly through the 4th of July holiday. A thermal ridge will build to the west while a trough in the jet stream will develop through the Midwest and Great Lakes region. This will dislodge cooler air into the region with highs next week in the low 80's and upper 70's. A wind shift line occurring over Northern Illinois due to a trough of low pressure (elongated area of low pressure) could help produce a few non-severe funnel clouds early this evening. There was one observed funnel cloud in La Salle County, near Sheridan, shortly after 6pm Thursday evening. Don't panic, because atmospheric conditions are not favorable for any of these funnels to turn severe and they usually don't last. The funnel clouds usually lower a few hundred feet down from the cloud, rotate or spin like a top for a few minutes and then usually dissipate. These type of funnels clouds rarely touch the ground and usually don't pose any threat as the atmospheric conditions are not favorable for long lasting funnel clouds, or tornadoes. Tornado Warning counties for Dekalb and Lee county. 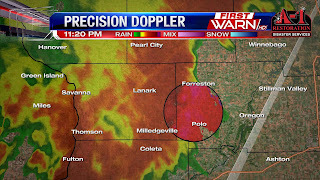 A confirmed tornado was located south of Paw Paw or 9 miles SW of Shabbona. Moving east at 30mph. (7:40:39 PM) nwsbot: LOT continues Tornado Warning [tornado: OBSERVED, hail: <.75 IN] for De Kalb, La Salle, Lee [IL] till 8:15 PM CDT ...AT 739 PM CDT...A CONFIRMED TORNADO WAS LOCATED NEAR COMPTON...OR 10 MILES NORTH OF MENDOTA...MOVING EAST AT 15 MPH. (7:40:39 PM) nwsbot: Local Storm Report by NWS LOT: Compton [Lee Co, IL] trained spotter reports TORNADO at 07:38 PM CDT -- tornado near shaw road with tree damage. (7:38:35 PM) nwsbot: DVN issues Tornado Warning [tornado: RADAR INDICATED, hail: <.75 IN] for Bureau, Whiteside [IL] till 8:30 PM CDT ...AT 738 PM CDT...A SEVERE THUNDERSTORM CAPABLE OF PRODUCING A TORNADO WAS LOCATED NEAR HOOPPOLE...OR 17 MILES SOUTH OF MORRISON... MOVING EAST AT 35 MPH. 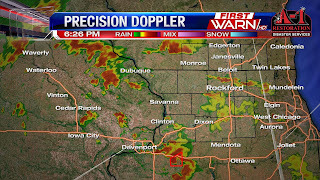 (7:34:05 PM) nwsbot: DVN issues Tornado Warning [tornado: RADAR INDICATED, hail: <.75 IN] for Bureau [IL] till 8:00 PM CDT ...AT 733 PM CDT...A SEVERE THUNDERSTORM CAPABLE OF PRODUCING A TORNADO WAS LOCATED 7 MILES WEST OF LA MOILLE...OR 11 MILES SOUTH OF WALTON...MOVING EAST AT 30 MPH. LOT continues Tornado Warning [tornado: OBSERVED, hail: <.75 IN] for Lee [IL] till 7:45 PM CDT ...AT 721 PM CDT...A CONFIRMED TORNADO WAS LOCATED 8 MILES EAST OF AMBOY...OR 10 MILES NORTH OF MENDOTA...MOVING EAST AT 25 MPH. We are basically in a 'hold' right now with thunderstorm development. 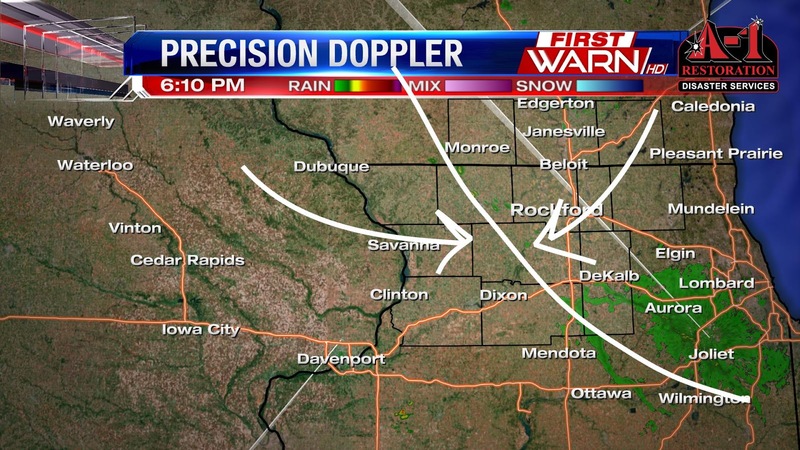 There have showers developing to the west over Eastern Iowa, which is where we thought they would initially develop, but the progression of them have been a bit slow. The rain from this morning basically put a 'lid' on our atmosphere for the afternoon. With the increase in moisture (rise in dew points) and sunshine we did manage to see for a time today, that helped to remove that lid on our atmosphere. The warm front is also lifting north into central Illinois and southeast Iowa. There has been a growth in development of showers over eastern Iowa, but they haven't grown much in height over the past hour. The image to the left is shows the potential energy in the atmosphere, but also where there is that lid (outlined in blue). This is a meso-analysis from the Storm Prediction Center. The red lines indicated the amount of potential energy in the atmosphere (measured in joules per kilogram) and the blue shading indicates how much of a cap we have on the atmosphere. What's interesting is the fact the showers over eastern Iowa now moving into northwest Illinois have had a hard time growing in height. This may be due in part to the cap still over northern Illinois. There is better instability south of Rockford, closer tied to the wind shift near Sterling and the warm front over central Illinois. The clouds have moved back in late this afternoon & evening but that could actually help to reinforce the warm front further to the south. So far this severe weather season has been pretty quiet locally, but that may be changing in 24 hours. Before we get into the forecast discussion, I want to stress the importance of planning! With the proper planning you will be prepared for any weather event. And that's important! Tonight, Tuesday night, I want you to sit down with your family and discuss where you would go if severe weather were to occur. Do you have a basement? If not, where on the lowest level of your home would you need to be. Best place would be an interior room, such as a bathroom or closet, and away from windows. Think about putting as many walls between you the outside as possible. How about a safety kit. Do you have one that is either located in or near your safe place? If not, can you easily take that with you should you need to take shelter? These are the questions and discussions you need to have with your family so everyone knows what actions to take when severe weather occurs. Don't be afraid to ask your place of employment where you would need to go if severe weather were to occur while you were working. If you're out at the store, take time to ask a store manager where the safest place in the store would be. If you're going to be outside, look for where you would need to take shelter. And make sure you have multiple ways to receive watches and warnings. Now, let's get into the forecast for Wednesday because even 24 hours out there are still a few 'what if's'. Showers and isolated thunderstorms have already started to develop over central Iowa near Cedar Rapids. 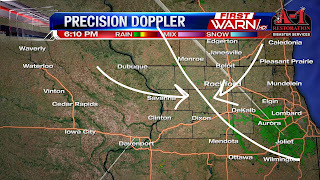 This was expected as the low level jet begins to increase and runs into the warm front well south of the Stateline. The general motion of those storms are to the southeast. So it's going to be a while before we see anything move into Northern Illinois. A Flash Flood Watch has been issued for all of Northern Illinois beginning late tonight for our NW counties and early Wednesday morning for North-Central Illinois. As the low level jet increases tonight it will help push the warm front northeast closer to west-central Illinois late tonight and early Wednesday morning. 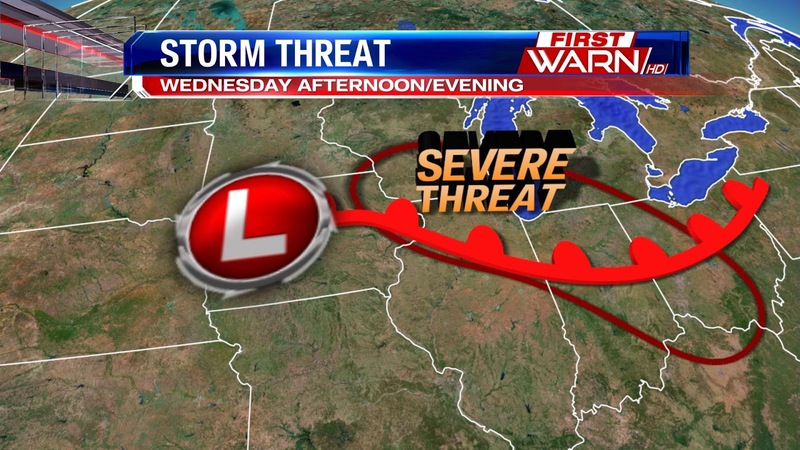 The expectation is that the storms out west in Iowa will continue to grow along the warm front, with storms that are now over the Northern Plains moving southeast along the front closer to Northwest Illinois by Wednesday morning. It's possible that the heaviest rain axis may stay just west of the immediate area closer to the Mississippi River and Eastern Iowa. Either way, the severe threat for Wednesday morning will be relatively low. Biggest weather threats for the morning will be heavy rainfall and isolated large hail. The hail would occur as storms become elevated, meaning they are north of the warm front and displaced a little from the more unstable air. Most of our models have a lot of the morning activity moving out of here a little before Noon. Then our attention will turn towards Wednesday afternoon and evening. I want to stress that it is not set in stone that we will see severe weather Wednesday afternoon. Limiting factors to anything developing during the afternoon would be if the morning activity keeps the warm front south of the Stateline. 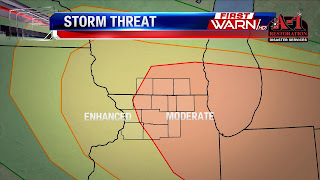 If that's the case, storms would be more likely to develop closer to west-central Illinois. If storms from the morning do clear out early then the warm front could quickly pull north and actually move into Southern Wisconsin. If that were to happen then our temperatures would warm quickly, but the extreme warmth aloft could place a 'cap' on our atmosphere not allowing thunderstorms to break through that cap and grow in height. 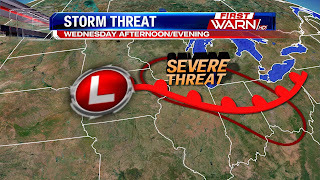 The scenario that would bring us the highest severe weather threat Wednesday would be if the warm front were to lie near the Wisconsin/Illinois border or just slightly to the south. Where the low pressure, warm front and cold front meet is referred to as the 'triple point'. If clearing does take place during the afternoon, storms would quickly develop near the triple point. Initially these storms would be supercells posing a wind and even tornado risk. The reason for the tornado threat is because of the great amount of wind shear in the atmosphere. Winds at the surface will be coming in from the south/southeast while winds in the upper level of the atmosphere are coming in from the west/northwest. This creates a great amount of spin in the atmosphere which is what is needed to get rotating thunderstorms. Individual storms will then quickly grow into a damaging wind MCS and move east along the warm front near Chicago and Indiana. 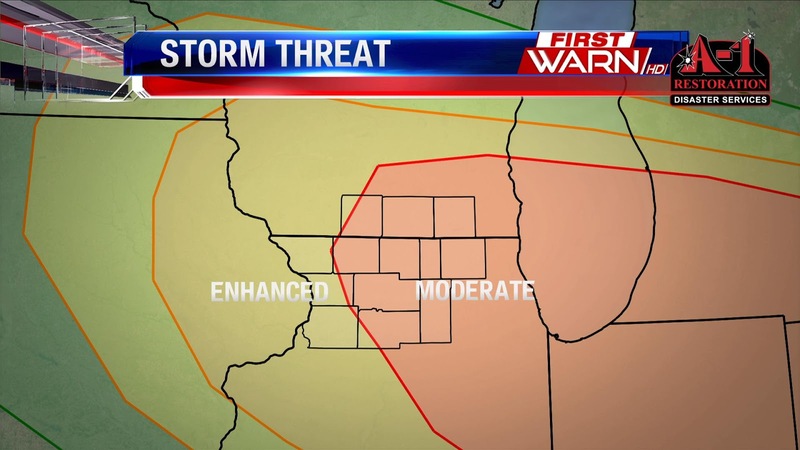 If storms develop right over North-Central Illinois, there will be a higher threat for tornadoes. If storms initially develop to the west of us, our threat could turn into a damaging wind threat. 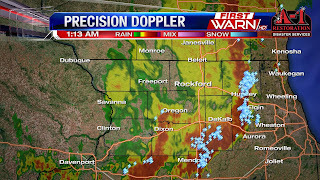 Morning storms will move in west of Rockford between 4am and 7am. General motion of these will be to the southeast along the warm front. Should afternoon storms develop the time frame for those would be between 4pm and 11pm. Again, it's important to plan and pay attention to the forecasts for Wednesday. A lot can change between now and Wednesday afternoon. And a little bit of a shift in the warm front, low pressure or morning storms could have a BIG impact on what happens in the afternoon. 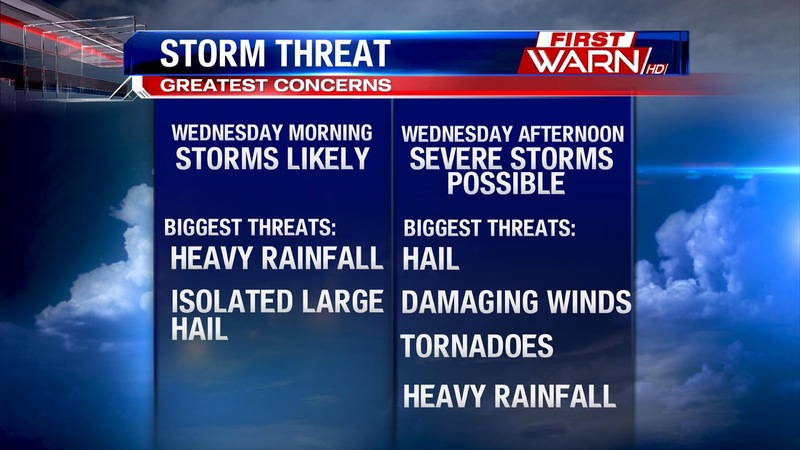 As Chief Meteorologist Candice King mentioned in the previous post, a threat for severe weather is high Wednesday. Not much has changed in the set up for Wednesday but I wanted to outline the timing of the storms and what you can expect as of now. First off, the Storm Prediction Center has outline most of the Stateline in a Moderate risk for severe weather, and our western counties under an enhanced risk. An Enhanced Risk is defined by the SPC as "numerous severe storms possible." While a Moderate Risk is defined as "widespread severe storms likely"
However, there are still a lot of ingredients that need to come together first, for us to see storms. Also, the small scale details are not well defined yet, and that will have an impact on locations and the magnitude of storms. Storms will begin to develop overnight in Iowa and southern Minnesota and will track along the warm front into the pre-dawn hours Wednesday. So about 3/4am in the morning storms will move in from the west and head eastward. These storms have the potential to turn severe but the higher threat for severe storms arrives in the evening. For the morning, the highest threats we are watching for is very heavy and torrential rainfall and large hail. Damaging winds is a secondary concern, but definitely possible to see strong damaging winds. There will also be a localized flash flood threat in the morning hours with a lot of moisture available in the atmosphere. As the forecast sits now, storms look to exit the area around 10-11am. The afternoon storms have a higher potential to turn severe, however storms have to form first, and that will depend on what happens in the morning. If the am morning storms linger longer into the afternoon then the atmosphere won't have time to 'recharge' or destabilized again. Essentially, the morning storms could zap the energy for the afternoon. If storms do form then again, they will have a high threat to turn severe. 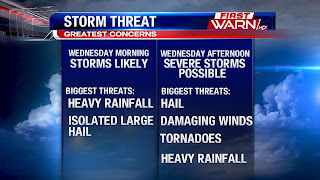 Again, the highest threats will be heavy torrential rainfall, strong damaging winds, and hail. Tornadoes are a possibility in the initial stages of storm development. Watch for storms to redevelop from 3pm-9pm as storms then head to the east into the Chicago area. As we know, forecasts can be shifted or changed so make sure to check back for more updates as we get a little closer . Make sure your weather radios are ready to go and you have a severe weather plan in place in case you do see severe weather. The Storm Prediction Center has placed most of Northern Illinois and Southern Wisconsin under an 'Enhanced Risk' for severe weather for Wednesday. If everything comes together, Wednesday could potentially be a dangerous day. However, before we get too excited about that potential it's important to look at the features in the atmosphere giving us that threat. Monday's high temperature reached 92 degrees, a hot one! But a cold front has passed bringing an end to some of the higher humidity. That front will stall to the south Monday night and Tuesday, but be pulled back north as a warm front Tuesday night and Wednesday morning. 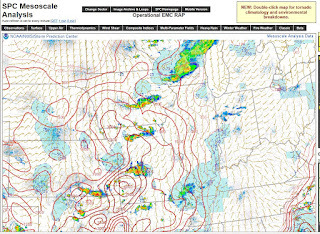 As we get further and further into the summer months, storm systems known as MCSs (Mesoscale Convective Systems) become more common. 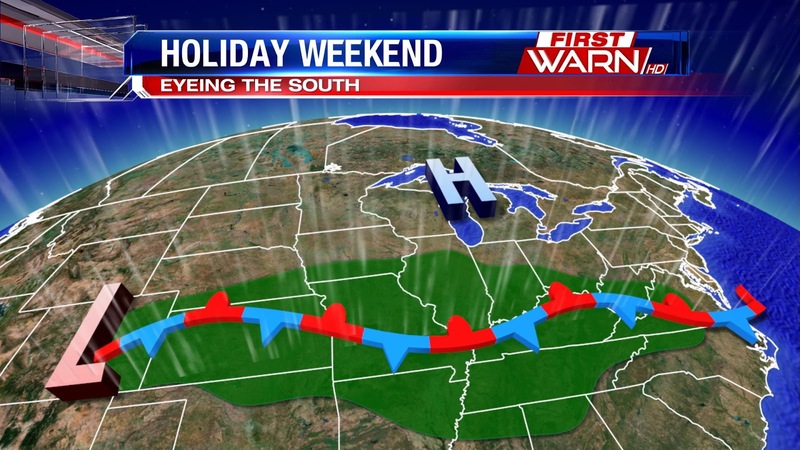 The warm front may become a little more defined to the south near the Missouri/Iowa/West-Central Illinois borders. As the low level jet (strong winds in the lower part of the atmosphere) increase Tuesday evening and Tuesday night, a warm and moist air mass will pulled towards the front. This will occur at the same time stronger winds within the atmosphere will be moving over the Upper Midwest. Thunderstorms will likely develop over northern Iowa Tuesday evening as move southeast along the warm front Tuesday night into Wednesday morning. 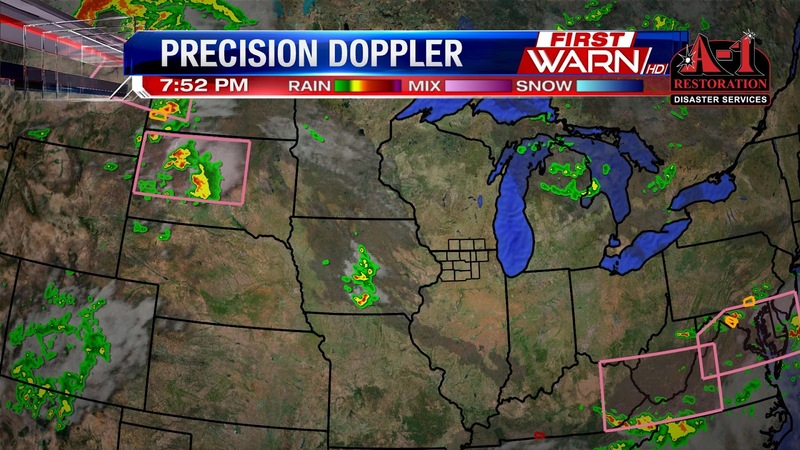 It's possible that these storms form into an MCS when reaching southern Wisconsin and northern Illinois Wednesday. If so, a high wind and heavy rain threat would occur early Wednesday. The afternoon is where it gets interesting. If this storm complex does occur and is quick to leave allowing our atmosphere time to destabilize during the day, the warm front that was to the south Wednesday morning would then become the focus point for additional thunderstorms (some likely severe) by late afternoon and evening. These, too, would pose a high wind threat, but also a slight tornado risk initially. I believe thunderstorms during the morning Wednesday are a very good bet, with the afternoon depending heavily on what happens during the morning. Stay weather aware the next couple of days and we'll continue with the updates right here! Another threat will be the possibility of flash flooding due to the extreme amounts of moisture we will have in the atmosphere. Wherever the warm front ends up will allow thunderstorms to continuously move over the same areas. Definitely something to watch as well. We've had some pretty decent rainfall over the past couple of weeks and depending on where you live in Northern Illinois, it's almost been too much. Unfortunately that hasn't quite been the case for Rockford. Yes, we had some very heavy rainfall last week but we're still running over an inch under where we need to be! However, ask anyone to the south and they'll likely tell you they've received way too much. The recent warm spells do pull a lot of moisture out of the ground so that's how we're quickly able to dry up following the heavy rainfall. Sunday night will be dry, but a few showers will dot the skies for the first half of Monday ahead of a cold front. Higher chance for thunderstorms may stay just to our south as the cold front will be south of Rochelle during peak heating of the afternoon. That front will pull back north as a warm front late Tuesday into Wednesday morning. As it does a fairly moisture rich air mass will follow the front leading to heavy rainfall over the Midwest, and possibly over Northern Illinois and Southern Wisconsin. Along with the possibility of heavy rainfall, there will also be the threat for strong to severe thunderstorms Wednesday afternoon. It's a little too early to pinpoint exactly where those storms could develop, but a very warm and unstable air mass will be located just south of the warm front. Wherever that front ends up will help determine where the stronger thunderstorms will be. Sunday's high temperature reached 88 degrees, just shy of the forecast high of 90 degrees. But so far for the month of June we've definitely had our share of warmth. June is averaging roughly two degrees above normal, and there doesn't appear to much cool air arriving in the near future. 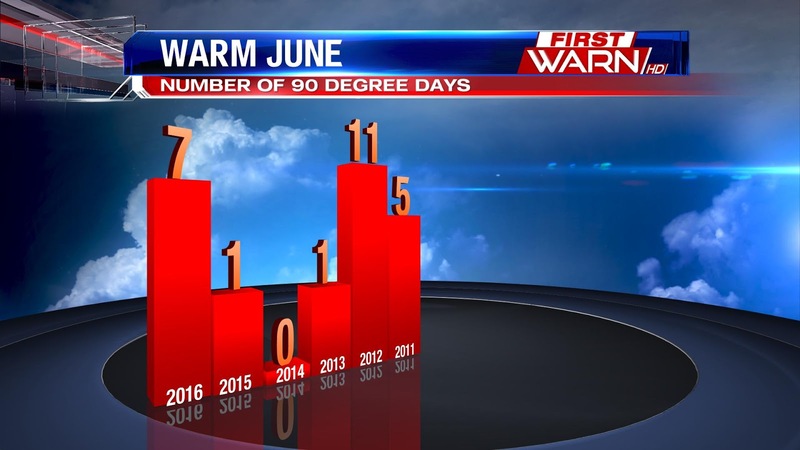 But with the string of 90 degree days we've had already, I wondered just how many times we reach 90 degrees, or higher, during the month of June. Looking over 30 years of climate data (1981-2010), we average roughly 3.6 90 degree days, or higher, during the month of June. July averages 5.5 days and August averages 3.6 days. 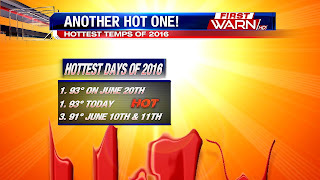 Looking back over the past four years: June 2015 - one day, June 2014 - no days, June 2013 - one day and June 2012 was very hot with 11 days reaching 90 degrees or higher!! Monday's high could come close to 90 degrees, but a little more cloud cover may limit us to the upper 80's. Another warm up headed to the Stateline for Father's Day weekend with temperatures warming through the mid 80's to 90° by Sunday. Temperatures fall into the upper 70's behind a cold front Monday night through the middle and end of next week. The cold front will be combined with a developing dip or trough in the upper levels in the atmosphere as an upper level low flattens the ridge. A ridge typically brings the warmth. While we stay on the cooler side, quite a bit of heat builds to the west. But what about the rest of July? Well the Climate Prediction Center has issued it's latest July outlook, and the Stateline and really the rest of the country show trends that it will be an above average month. The darker shades correlate to a higher probability to see the above average temperatures. The average high temperature for Rockford through the month of July is 84°. Though above average means we will see warmth, we will also pepper in some cooler days as well. Trying to understand why we reference dew point temperature rather than relative humidity when referring to how humid it is outside can be a little difficult to understand. To try and get a better understanding, let's first discuss what each means. Dew point temperature is a direct measurement of how much moisture is in the atmosphere. We know how the weather makes us feel. A humid afternoon makes it feel more 'sticky' outside, like Wednesday. While afternoons like Thursday felt a little more comfortable. That is a result of the dew point temperature. Dew points Wednesday were in the low 70's, a very tropical air mass. That made many of us feel uncomfortable. Dew points by Thursday afternoon were in the upper 50's and low 60's. This may have made you feel a little more comfortable when being outside. Think of the dew point temperature and your comfort level as an almost direct correlation. Relative humidity is a measurement of how saturated the air is. When the relative humidity is less than 40%, the air feels dry. When the relative humidity is above 80%, the air feels moist. Relative humidity also changes throughout the day. During the evening and overnight as the air temperature cools closer to the dew point temperature, the relative humidity gets closer to 100%. And that's why often times in the morning we have a high relative humidity number. Throughout the day as the air temperature warms, it gets farther away from the dew point temperature causing the relative humidity to decrease (most times). If you're still a little uncertain, let's take this example. On a hot and humid afternoon, like Wednesday, when the temperature was close to 90 degrees and the dew point was near 70 degrees, the relative humidity was only between 50% and 60%, but it felt very humid outside, even though the relative humidity was low. This morning (Thursday) the relative humidity was in the low 80's but then dropped into the 60's during the afternoon. 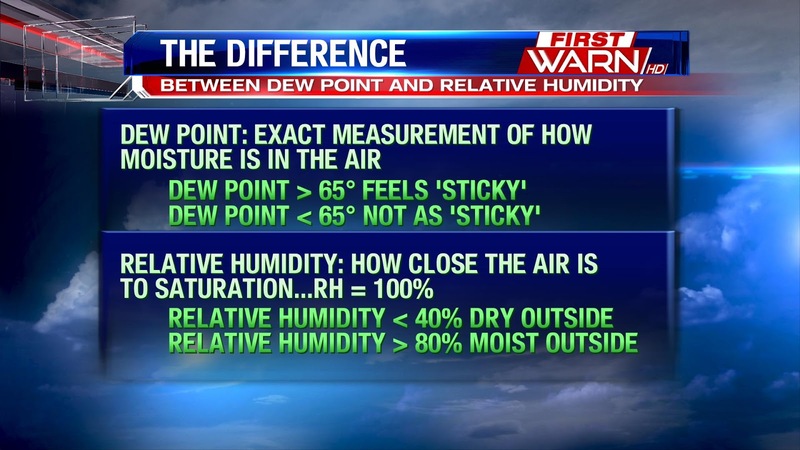 This is why the dew point temperature is a better measurement of how humid it feels to you when outside. It will be a cooler afternoon today compared to yesterday's 90 degree day. It was also very sticky with a July like airmass in place and dew points in the low 70's. Today, the humidity will lower later in the day with highs in the upper 70's and a north west wind at 5-15 mph. Temperatures will slowly warm into the weekend as we climb into the mid 80's and then the 90's return once again by Sunday. While we cool things down, it heats up across the central and southern plains. 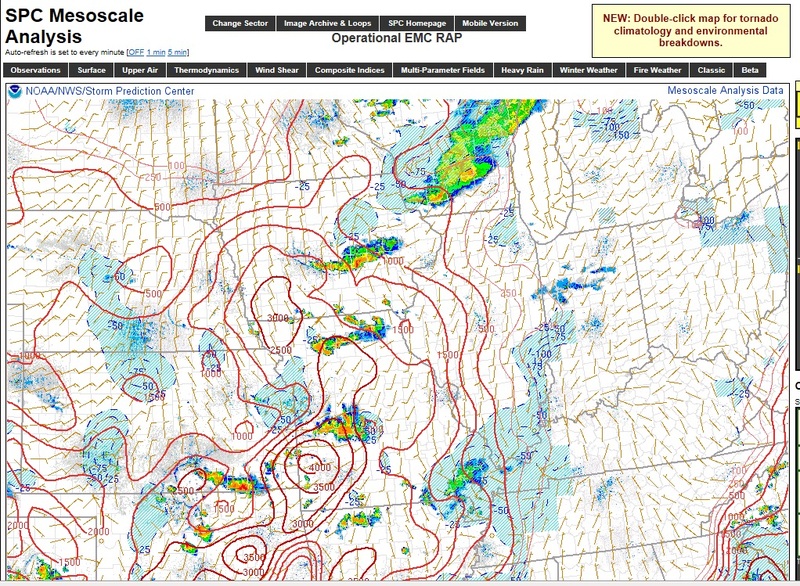 A big ridge is developing and strengthening just west of the Stateline, there are already numerous heat advisories and excessive heat warnings all the way from St. Louis through the plains in Oklahoma, in southwest Iowa and through most of Missouri. 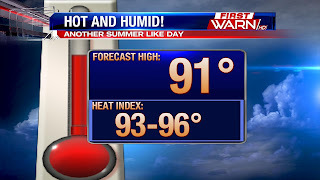 Temperatures will climb to about 10-15 degrees above average with heat index values ranging from 100°-110°! Back in the Stateline despite another heat up, temperatures cool again with another cold front by the middle of next week. Phew...it was humid Wednesday afternoon. So humid that the heat index in Sterling, IL reached 100 degrees briefly late in the afternoon! No thank you! But why did it feel so muggy outside? It's because our dew point temperatures were very high. Dew point temperatures (exact measure of the amount of moisture we have in the atmosphere) were in the low 70's. That's an extremely moist air mass - more like the tropics. There's a reason why our dew points were so high Wednesday and it has to do with the heavy rainfall from the night before. There are several ways for the dew point temperature to increase in the Midwest. A high moisture air mass is 'brought in' from the south, typically the Gulf, evapotranspiration from the surrounding corn crops during the summer, and rainfall. We received quite a bit of rain Tuesday evening and overnight. And most of that moisture soaked into the ground, although there were reports of flooding. 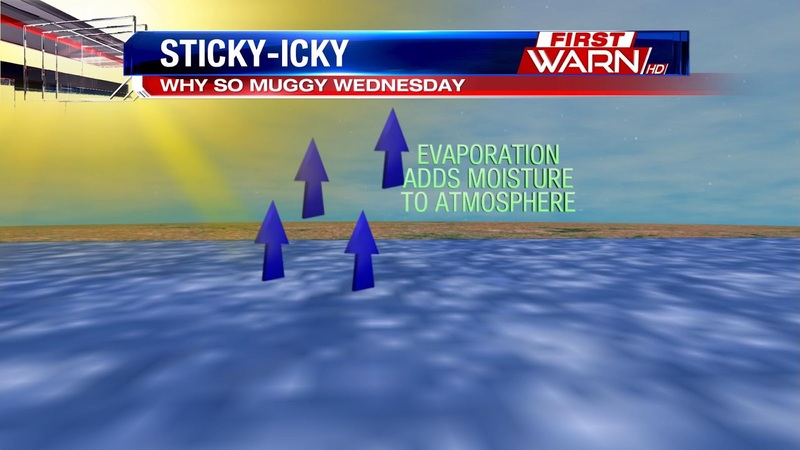 With the now moisture rich ground, the full sun we had Wednesday afternoon allowed that moisture to evaporate from the soil and into the atmosphere. We were essentially adding moisture into the atmosphere from our ground. The hotter it got, the more moisture was able to evaporate causing our dew point temperature to rise during the afternoon. 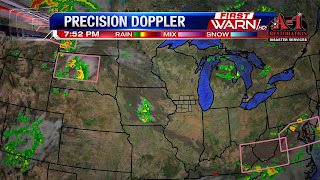 Wednesday evening a cold front tied to an area of low pressure in Wisconsin will pass through. Winds will gradually shift around to the west and then northwest by Thursday morning. Northwest winds typically bring drier air so our dew point temperature will decrease from the low 70's into the low to mid 60's Thursday. It'll probably still feel a little humid Thursday, but shouldn't be quite as oppressive as Wednesday afternoon. Big thank you to everyone who sent in rain totals or damage reports from the storms last night. If you have pictures of any of the damage, you can always send the to: weather@wtvo.com. Here's a look at some of the rain totals observed from CoCoRahs(weather observation network), the NWS, storm spotters, weather watchers, and viewers. Temperatures a little after 11am are already into the low 80's with abundant sunshine. Its going to have a muggy feel today with dew points still in the upper 60's. Highs this afternoon are going to warm into the low 90's but with high humidity its going to feel more like the mid 90's today. You'll want to make sure to drink plenty of water today and where light clothing. We will get a relief from the humidity tomorrow after a cold front passes late in the day today. However, ahead of the front a few isolated storms will be possible, especially in southeast Wisconsin and east of the Rockford area. Watch for a few storms to fire up after 3pm this afternoon, with heavy rain something that is a bit of a concern, after a lot of rain fell last night and early this morning. Most of northern Illniois will end of staying dry however. Northwest winds on Thursday will keep temperatures in the upper 70's under partly sunny skies, but it will feel more comfortable with drier air being worked into the area. 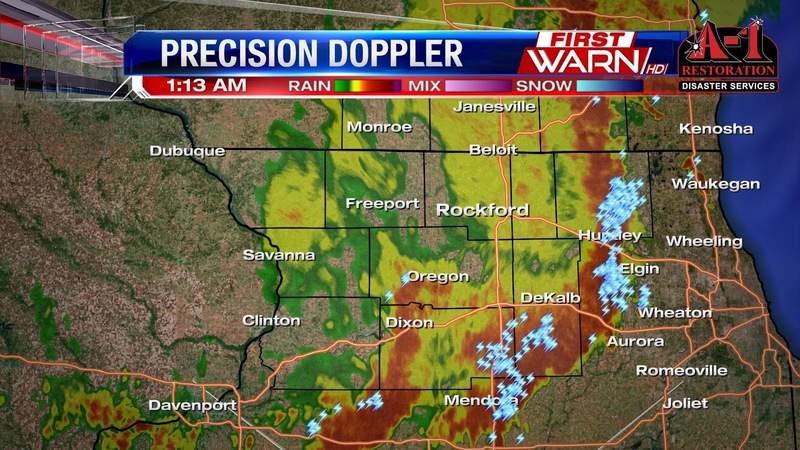 1:15am Update: The heaviest of the thunderstorms have moved to the east of Rockford, but there is still very heavy rain falling through Lee and central/southern DeKalb counties. The rain will continue for the next couple of hours, but the severe threat has diminished. 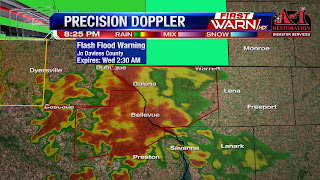 Flash Flood Warnings do remain in effect for Jo Daviess and Stephenson counties. (12:24:46 AM) nwsbot: Local Storm Report by NWS LOT: Oregon [Ogle Co, IL] 911 call center reports TSTM WND DMG at 14 Jun, 11:50 AM CDT -- numerous trees and powerlines down throughout the county, too busy to give exact locations, but oregon hit hard. (12:02:46 AM) nwsbot: Local Storm Report by NWS DVN: Lena [Stephenson Co, IL] emergency mngr reports FLASH FLOOD at 11:50 PM CDT -- highway 20 near lena reported to have 6 inches of water across it. (12:45:12 AM) nwsbot: Local Storm Report by NWS MKX: Janesville [Rock Co, WI] 911 call center reports HEAVY RAIN of E2.50 INCH at 12:35 AM CDT -- rock county dispatch reported water covered roads around the county. rainfall total of 1.6 to 2.5 inches is from radar estimate. electrical transformers have blown in scattered locations across the county. Storms moving in from the west have gained a little more speed and could pose a wind threat for the next couple of hours. Wind gusts near 50-55mph are possible with this line, along with the heavy rainfall. 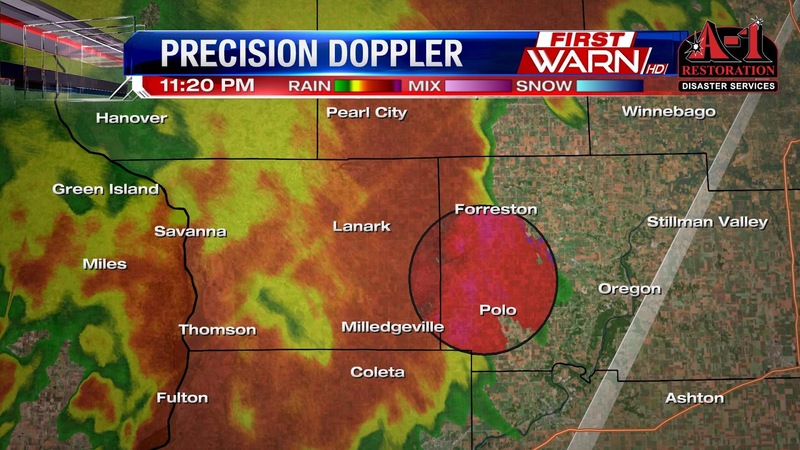 11:20pm Update: Strong winds likely between Forreston and Polo with the storm moving into western Ogle County. Wind gusts 45-55mph possible with this line. 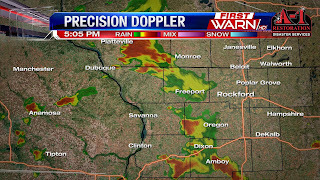 The Severe Thunderstorm Watch has been cancelled for Stephenson, Jo Daviess and Carroll counties. Main threat continues to be heavy rainfall through 2am. Read the technical discussion from the Weather Prediction Center regarding the flash flooding potential tonight. NORTHERN IL INTO EARLY MORNING HOURS. (WHICH IS ABOVE THE 99TH PERCENTILE FOR MID JUNE). IMPRESSIVE...WITH A 2.20 PRECIPITABLE WATER VALUE AT KDVN. APPEAR AS THOUGH IT CAN SUSTAIN AN ORGANIZED FLASH FLOOD THREAT. OBSERVATIONS NEAR AND SOUTH OF THE WARM FRONT HAVE BORNE THIS OUT. 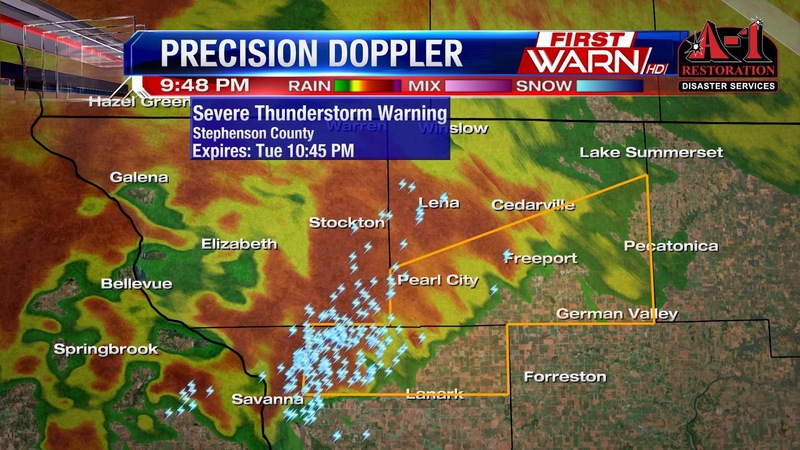 9:50pm Update: A Severe Thunderstorm Warning has been issued for Stephenson and Carroll counties until 10:45pm. This storm was located just to the north of Mount Carroll and moving east/northeast at 35 mph. Cities likely impacted by this storm include: Freeport, Pearl City, Cedarville, Ridott and German Valley. Stay indoors and away from windows until this storm passes. (9:38:06 PM) nwsbot: Local Storm Report by NWS DVN: Galena [Jo Daviess Co, IL] law enforcement reports FLASH FLOOD at 09:36 PM CDT -- flash flooding occurring in town. 9pm Update: A Flash Flood Watch has been issued for Winnebago, Boone, McHenry, Ogle, Lee and DeKalb counties until 6am Wednesday. Incoming thunderstorms over Wisconsin and Northwest Illinois have had a history of producing very heavy rainfall. While not widespread tonight, rainfall amounts of 3" to possibly 4" will be possible by Wednesday morning. 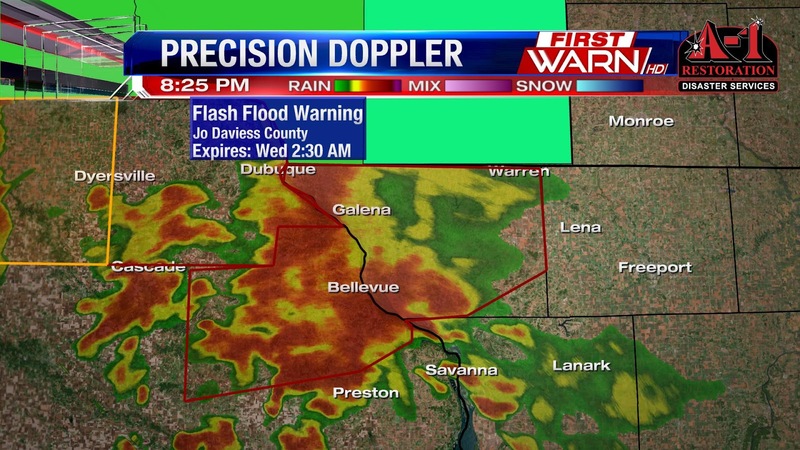 8:25pm Update: A Flash Flood Warning has been issued for Jo Daviess County until 2:30am Wednesday. Radar estimated rainfall amounts of up to 3" of rain has fallen in the warned area. Another 2" to 3" is possible. With night approaching, it's important to remember to never drive through a flooded roadway. 6:20pm Update: Shortly before 6pm a Severe Thunderstorm Warning had been issued for Ogle County. That warning has since been allowed to expire as the storm has fallen below severe limits. 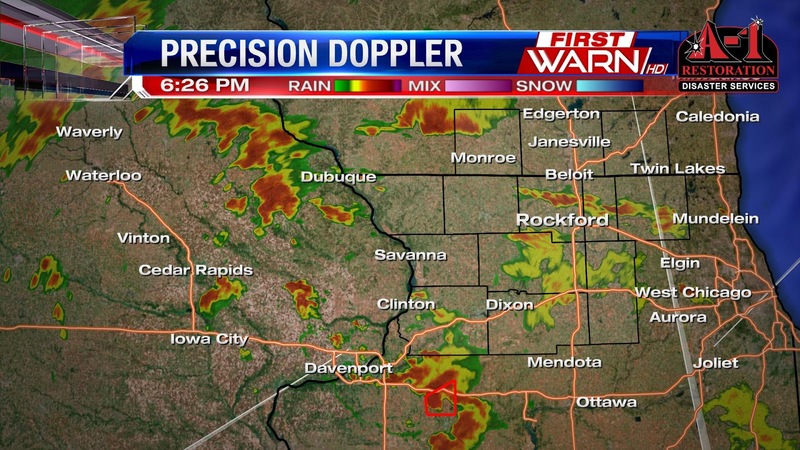 However, it will continue to produce heavy rainfall as it slides into Winnebago County. Additional thunderstorms have developed just south of our viewing area - with a Tornado Warning for Henry County until 7pm. This storm is currently moving to the east at 15 mph. 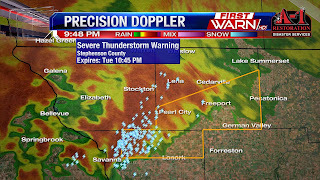 A Severe Thunderstorm Watch has been issued for Jo Daviess, Stephenson and Carroll counties until 11pm Tuesday evening. 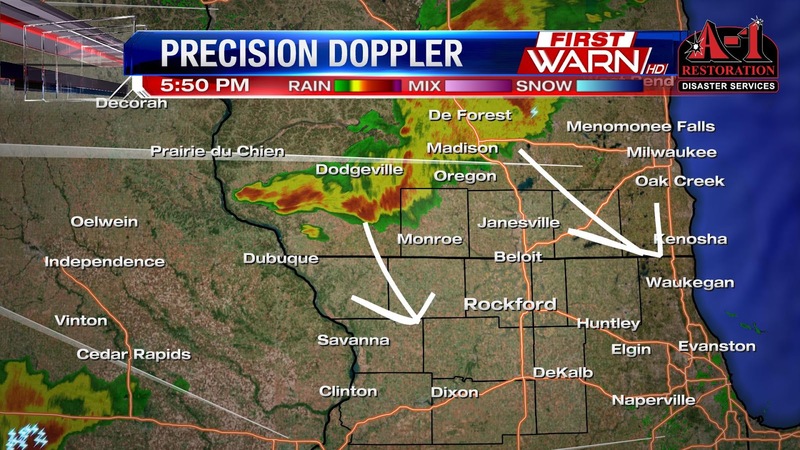 A warm front developing southwest of Rockford has a line of mostly non-severe storms forming along it. At times those storms have shown enough strength to potentially produce a few stronger wind gusts. However, most of the severe weather has been further northwest over Minnesota and northern Iowa closer tied to an area of low pressure. A slight decrease in instability over northern Illinois has allowed for a very slow weakening trend in the current band over NW Illinois, but those storms will continue to march to the Northeast. Greatest threat with these will be heavy rainfall. Storms further west in Iowa will continue to grow in coverage through the evening and pose another risk for thunderstorms into the evening and overnight. Again, heavy rainfall is going to be the greatest threat with any storms that do move through.